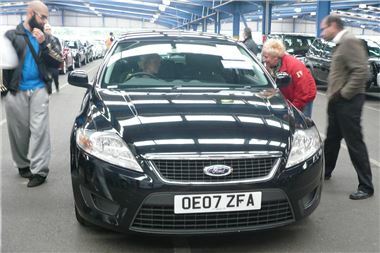 I started to get the message when a metallic red 07 Mondeo 1.8TDCI 125 Edge estate with 96k miles sold for £5,350. Then this rough 95k mile 07 1.8TDCI 100 Edge hatchback rocked up, reached its reserve of £4,400 and sold for £4,500. There’s nothing wrong with Mondeo residuals. A 24k mile 08 2.0TDCI Zetec estate sold for a solid £11,000. It’s simply that today’s much smarter market values mileage, condition and spec even more than it used to. No point in a cheap car if its going to cost money to fix and still not be worth very much. They aren’t worth the risk unless they’re super cheap. Another example: two 07-reg LandRover Discovery 2.7TDV6 automatics. The relatively base spec car with 43k miles sold for £15,400, while the HSE with 48k miles sold for £23,300. Base spec doesn’t sell. HSE does. Fact of life. But, of course, something for a punter who wants a Disco 3 but doesn’t have much money to take advantage of. A 16k mile current model 09 Fiesta 1.6TDCI Zetec made a creditable £8,800. Cheapie of the day to my mind was a 30k mile 2008/57 Cold 1.1 CZI, still under warranty, which sold for just £2,550. While best buy of the day was? Just run your eyes down the list and see how quickly you spot it. Once again, BCA Blackbushe will be pulling out all the stops to put on a 400-car mega sale for the Bank Holiday crowds on Monday 30th August.